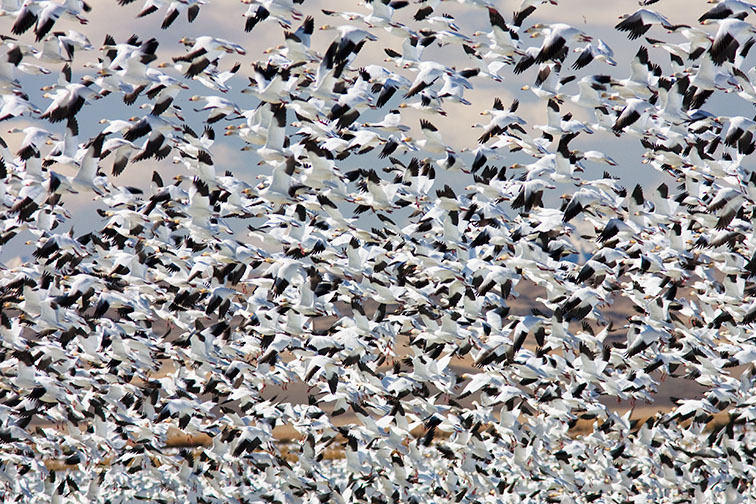 We had word that the snow geese migration was in effect and having never witnessed the event, a friend and I decided to take a drive up and scope it out. I had previously been in the Fall, but nothing I had seen before prepared me for the amount of birds we saw this day. At some reports, it was in the hundreds of thousands. Whatever the count, it was truly amazing. Freezeout Lake is a stopping point on the birds migration route back into Canada. They rest here and feed on the grain in the fields surrounding the lake. We arrived in the afternoon and managed to get a decent view close enough from shore to photograph. After a couple of hours we decided to move closer down the shoreline to get a better vantage point and I think we may have spooked some of them. And it wasn’t just a few we spooked, it was thousands. They rose up like a wall in front of us and the site was incredible. We shot for a couple more hours until flock by flock the birds headed out to feed for the evening. If you haven’t seen this spectacular event, I would highly recommend it. Totally awesome! Looks more like a gazillion. To look at the bottom half of the photograph one would be hard pressed to identify the subject. Then as I looked up and was able to find individuals I realized that this was indeed a very fortunate moment. having just watched the movie versin of “Even Cowgirls Get the Blues”, I was about ready to hitch a ride all the way from Baja just to see them, maybe dress up in a snow goose suit and see how close I could get.